“This year on Baishakhi, 100 years of Jallianwala Bagh massacre is being observed across the country. Unfortunately, Bengal has been more invested in Ram Navami celebrations and the competitive communalism that is taking place between the BJP and the Trinamool Congress,” Yechury said. CPM general secretary Sitaram Yechury Sunday said TMC and BJP and engaging in competitive communalism over Ram Navami celebrations across West Bengal. He also claimed that there is a tacit understanding between the two parties in the Lok Sabha polls. “This year on Baishakhi, 100 years of Jallianwala Bagh massacre is being observed across the country. Unfortunately, Bengal has been more invested in Ram Navami celebrations and the competitive communalism that is taking place between the BJP and the Trinamool Congress,” Yechury said at state CPM headquarters. Yechury also accused the NDA government of trying to use the armed forces to polarise the elections in the face of its imminent defeat. He said it is “quite evident” from the anger against the present dispensation at the grassroots that a secular democratic government will come to power after the elections. “Recently, a report came out where it stated that bank loans of corporates worth Rs 5.5 lakh crore were waived off in the last five years. This only sums up from where the BJP is getting so much money in terms of electoral bonds. 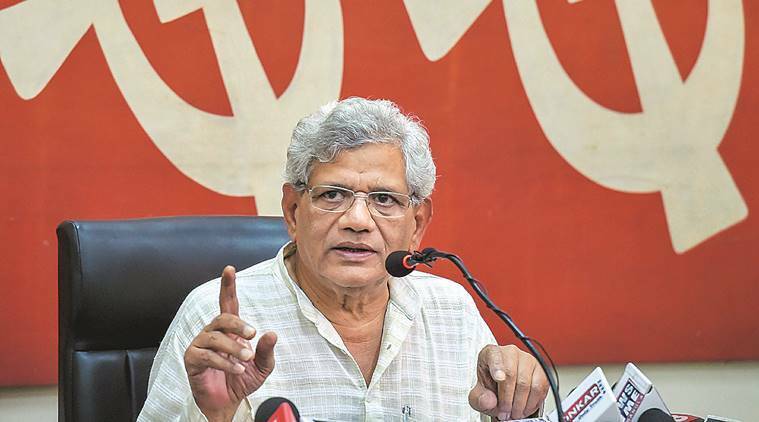 “This Modi government rests on twin pillars of loot of natural resources, cronyism and more misery for poor and common masses,” Yechury told reporters here. He said the saffron party would face the same fate as in 2004, when it lost the general elections. “We have full faith in Indian voters. In 2004 also, the BJP raised the issue of opposition being rudderless and they had Atal Bihari Vajpayee leading from the front. But, we had seen they were defeated and Manmohan Singh became the prime minister for the next 10 years. “This time, too, the same thing is going to happen, a secular democratic government will come to power after the elections,” he said.